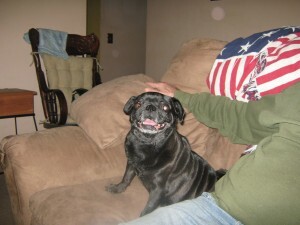 Leah has fit in perfectly, my other Pug “Mokie” just loves her. I was kinda worried, but he made her feel right at home, he gives her kisses all the time. This past Saturday I took Leah and Mokie to a Pug xmas party at the Kennel Inn, and they had a blast. I am so glad she is with us, we love her.